RAF coverall, aircrew, MK.11. Stores ref. 22c/1300200. Dated November 1971. Size 7 (height 5'11" - 6'2", chest 36" - 39"). 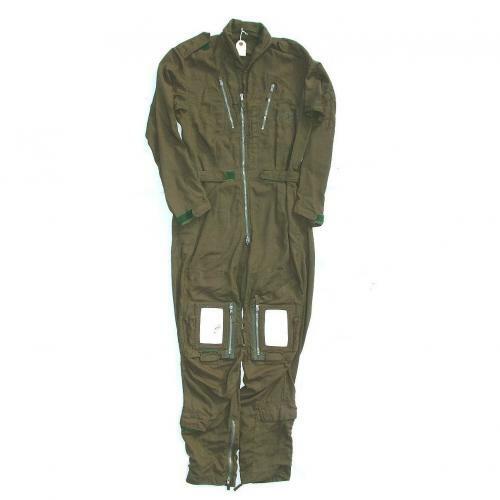 Olive green flying suit with full front zip, zipped chest pockets, knee pockets/knee board provision, lower leg pockets, waist side-seam entry pockets, zipped lower legs, pen pockets, velcro adjustable waist and wrist tabs etc. The suit is quite clean and in very good used condition. All zips are original and in good useable condition. Evidence of patch removal. Stock code S21572.